Pope Francis expressed “his heartfelt sorrow and spiritual closeness” to all those hit by the powerful earthquake and many aftershocks in central Italy very early this morning. The quake left at least 120* people dead, including many children, obliterated mountain villages and caused the collapse of countless private homes and public buildings. He offered his prayers at the beginning of his weekly public audience in St. Peter’s Square, Aug. 24. Putting aside his prepared text, he invited the thousands of Italians and pilgrims present to join him in praying the rosary for the many victims of that terrible earthquake. The 6.0 magnitude earthquake struck three regions—Lazio, Marche and Umbria—at 3:38 a.m. this morning, killing many people—with the death toll still growing—and wiping out some mountain villages including Amatrice, Accumoli and Arquata del Tronto. These towns normally have very small populations, but because it is the holiday season many had returned home to spend time with friends and relatives. Fortunately, no highly populated town or city was hit by this latest natural disaster. The severe earthquake was felt in Rome, Naples, Florence, Bologna, Rimini, Assisi and locations in between these heavily populated zones. It was followed, over the next three hours, by lesser ones and 39 aftershocks that caused fear, spread panic and a sense of impotence. The rescue operation was launched with great rapidity and helped save many lives. Francis began his weekly public audience in St. Peter’s Square by telling thousands of Italians and pilgrims of his “heartfelt sorrow and spiritual closeness” to all those affected by the earthquake and its aftershocks. He said he was deeply saddened upon learning several children were among the dead and hearing of the total destruction of the town of Amatrice. “I also express my condolences to those who have lost loved ones, and my spiritual support to those who are anxious and afraid,” he added. He was referring to the many rescue workers from near and far who had moved with great speed to assist the thousands of distressed people, some of whom had lost family members or still looking for them under the rubble of collapsed building, and a great many of whom no longer have a home. He urged them together “with Jesus” to “let our hearts be moved with compassion” in the face of this latest natural disaster. He concluded by inviting them “to pray with me a part of the holy Rosary, the sorrowful mysteries,” and led them in this Marian prayer. Update: Aug. 24, 9:45 a.m. The Vatican has announced that Pope Francis has sent a team of six members of the Vatican City State fire brigade to Amatrice “as a concrete sign of his closeness” to the people there. They will join the Italian civil protection rescue effort. By the afternoon of Aug. 24, the death toll had risen from 38 to at least 120. 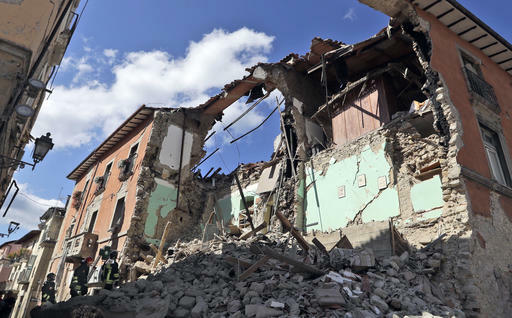 Pope Francis phoned the bishop of Rieti, Domenico Pompili, in whose diocese much of the destruction happened, and told him that he, too, felt the earthquake early this morning in his residence in the Vatican. He asked the bishop to assure the people there that he was spiritually close to them.